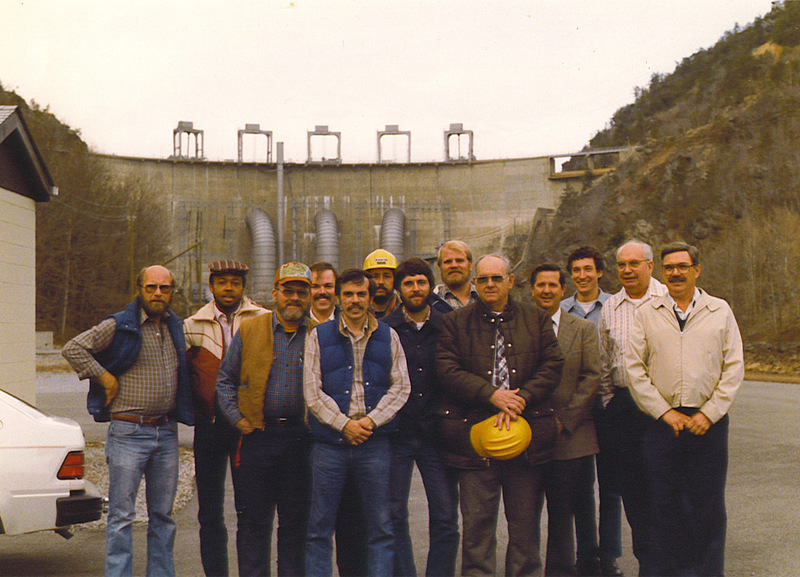 This is the maintenance crew at the Smith Mountain hydroelectric power plant, taken in the fall of 1982. From left to right Gerald Cook (retired), Charles Edwards (Rocky Mount Service Center), Morris "Whitey" Barbour (deceased), Kenny Worsham (Safety and Health Supvr.) , John Ritchie (deceased), Jimmy Wertz (retired), Mark Swartz (Leesville Hydro), James Holland (retired), Elton Quarles (deceased), Joe Plunk (deceased, Hydro Manager), Darrell Powell (Smith Mountain), Leroy Dalton (deceased, electrical Roa. office), Dale Fisher (retired, plant supervisor).